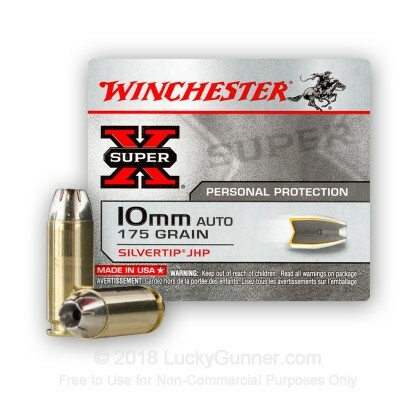 Winchester's Super-X Silvertip JHP ammunition was originally developed for law enforcement to replace traditional hollow points. Super-X ammunition is notched to ensure positive expansion upon impact. This bullet delivers impressive penetration and rapid energy release with virtually no weight-loss or bullet fragmentation. In order to find out how different self-defense handgun loads perform, we decided to do some ballistics gelatin testing of our own. 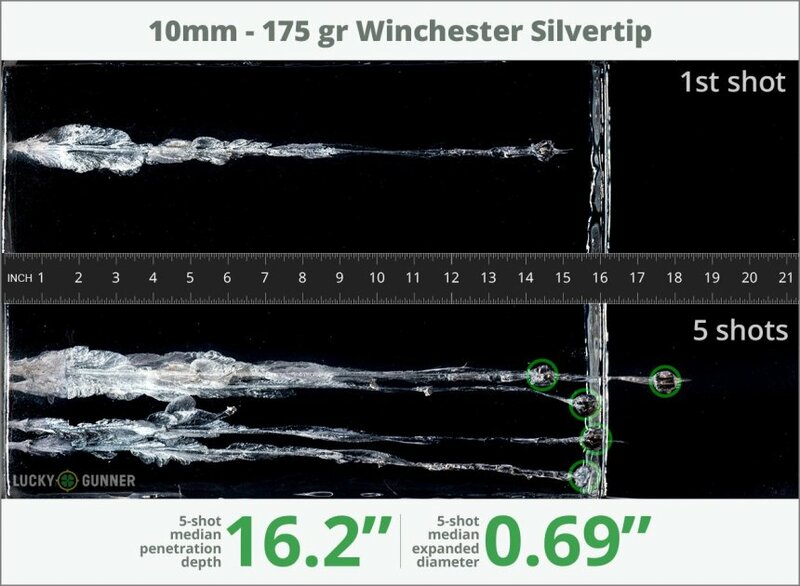 The chart below is a compilation of expansion and penetration data for Winchester 175 gr Silvertip fired from 10 feet, through four layers of fabric (to simulate clothing), using a Glock 20 pistol. The diagrams at the bottom of the page can give you an idea of how this load compares to other 10mm Auto self-defense loads that we tested. 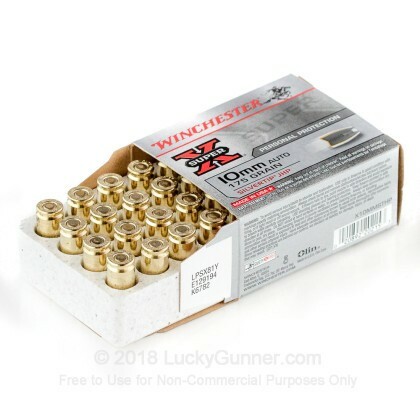 How do the results for this Winchester 10mm Auto compare to other 10mm Ammo? 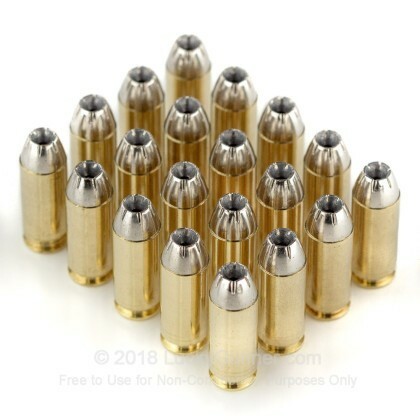 0.81" This ammo: 0.69" Min: 0.4" Median: 0.63" Max: 0.81"
16.2" 0" 11.7" 18.6" 48" This ammo: 16.2" Min: 11.7" Median: 18.6" Max: 48"
Shoots well, hits hard, while still being manageable in the gun. Not the hottest, but good SD load. Excellent defensive and deer hunting round. This is the round I use in a Colt Delta Elite as my “camp” gun. Not too weak, nor is it “too hot” where it beats up the Colt. (The Delta Elites should NEVER be loaded up with the super “rocket propelled” hot 10mm loading). The 10mm Silvertip is old technology but performs with the top front runners of 10mm defensive loads. It works fantastic on mule deer if you’re into handgun hunting! As far as a medium load goes, this round is great. This is just above the FBI "lite" load and just below a standard load which firmly places it in the self defense department. Great expansion, great energy dump in a short distance, and very good penetration. Now I will say that on this site it is abit on the middle end of pricing. 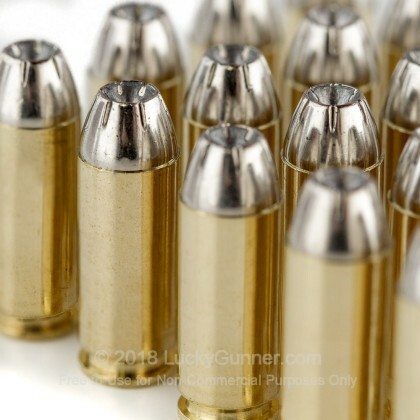 But other than that, if you are looking for round to use in an EDC 10mm platform this would be it. Even thought the Winchester Silvertip is a old school design, this loading is still offered. 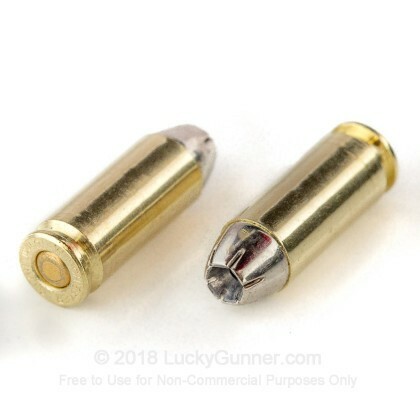 Advertised at 1290 FPS with 647 ft lbs energy, it is one potent cartridge. One of the best for the 10mm today. Q: What is the Muzzle Velocity (fps) of this round? 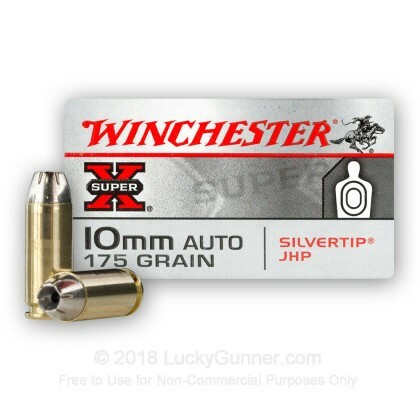 A: Scott, Winchester lists the velocity of this Silvertip JHP round as 1290 fps with a muzzle energy of 649 ft. lbs.